Four HISD students will travel free to Great Britain this summer, thanks to the British Foundation of Texas's (BAFTX) Junior Achievers award. The students will travel for nearly two weeks learning about British culture. Juniors Ziwei Guo (Bellaire HS), Yazmin Hurtado (Davis HS), David Jasso (Reagan HS), and Donald Peacock (Reagan HS) wrote compelling essays, obtained strong teacher recommendations, and demonstrated the academic excellence to stand out among the more than 100 applicants. 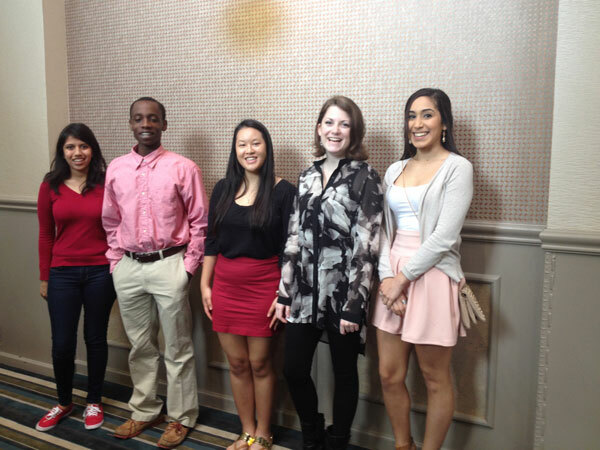 HISD juniors comprise four of the six winners from Texas and will be honored at an awards banquet in Houston on May 12, 2015. The students will visit sites of historic and artistic importance, such as the Tower of London, as well as attending a play in London's West End. Derek Blackwood, BABC Chairman, presented a check for the proceeds of the 2014 BABC Gala to BAFTX President Susan Howard. A Swansea University student will be swapping his beach shoes for cowboy boots when he kicks off his second year of study in Texas. Medical Engineering student David Rochelle has been awarded the first British American Foundation of Texas (BAFTX) funded scholarship to study at Texas A&M University (TAMU). David, whose home town is Cannock in Staffordshire, will be starting his studies in Texas in October spending his first semester at TAMU before continuing his studies back at Swansea.